Happy Friday, everybody. We made it to week’s end. But wouldn’t you know it? Millennials are still terrible. Admittedly this piece is over a year old, but I could not remember ever seeing it before. If you do not recall, last year there was a debate about the spending habits of millennials and why they are not out there buying homes and properties. The point was that we waste our money on experiences like expensive coffees and, most specifically, avocado toast. 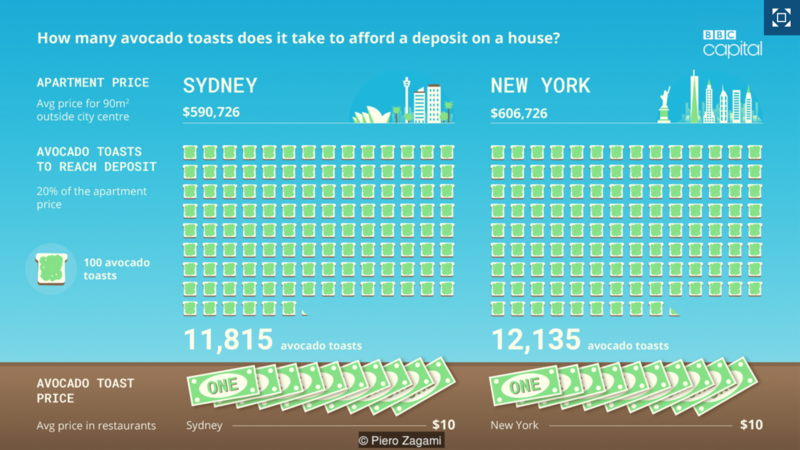 So amidst all this, the BBC decided to look at how many pieces of avocado toast would be needed to purchase an apartment in 10 global cities. Neither Philadelphia nor Chicago were on that list, but New York is. Note they even have local prices for avocado toast to make the index more accurate. Ultimately, I have never had avocado toast. But it sounds pretty good. But I find it a stretch to think the reason I do not own a home is because I am trying to eat 12,135 slices of avocado toast. Credit for the piece goes to Piero Zagami.